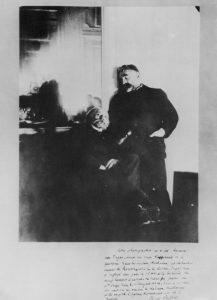 This photograph taken by Degas, shows Mallarmé (standing) with Manet. (c.) Wikimedia Commons. Avec la fleur des syringas. At 23 Rue Ballu. I express, as soon as June comes to Monsieur Degas, satisfaction that he rhymes with the flower of the syringas. Lloyd uses ‘boon’ to translate ‘satisfaction’ in Mallarmé’s original, but I don’t think she did this just for the sake of a rhyme. Describing the poem, Lloyd suggests that Mallarmé’s reference to the rhyming of ‘Degas’ with the woodland lilac, Syringa is intended as a friendly allusion to Degas’ own efforts at writing poetry. ** In other words, the ‘occasional’ quality of this poem is not simply the fact that it functions as an address: Mallarmé builds subtle compliments and hints about his relationship with the addressee into its substance. The quatrain is about rhyme and the rhyming of Degas. In Lloyd’s version, the rhyme of ‘boon’ and ‘June’ becomes part of the poem’s gift (boon) to the painter. With the flower of the syringas. Terry keeps ‘rhymes’ as an end-rhyming word from the original, confirming the reflexive quality of the poem (it rhymes about rhyme). But the line break ‘he rhymes / with’ opens up a nice ambiguity: it’s not just Degas’ surname that rhymes, but the person (and the friend) rhymes too, in a different sense. Terry and Lloyd respond imaginatively in their translations to the subtle energies that flicker through Mallarmé’s poem. But they also demonstrate the truism that no translation is definitive. There are always different solutions. 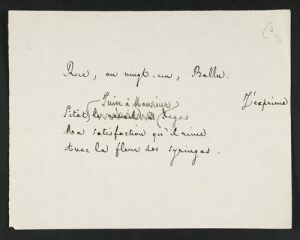 Special Collections at Glasgow University Library is lucky to hold a handwritten copy of Mallarmé’s postal quatrains. And we will be using these in the Spring as a translation case study for this project. This will offer the readers of this blog a chance to propose their own versions of these poems – in any language you see fit. So keep an eye on this space for further announcements. * Rosemary Lloyd, Mallarmé: The Poet and his Circle (Cornell University Press, 1999), p. 146. **In any discussion of Mallarmé’s (sometimes rocky) friendship with Degas, it is compulsory to cite Valéry’s famous account of his retort, when the painter complained that he had ‘too many’ ideas for writing poems: ‘It’s not with ideas that one makes poetry, Degas, it’s with words’ (Quoted in Lloyd, p. 147).